Where to dive in low season? We get asked where to dive a lot so here is a summary of where to dive to have your desired underwater encounter. 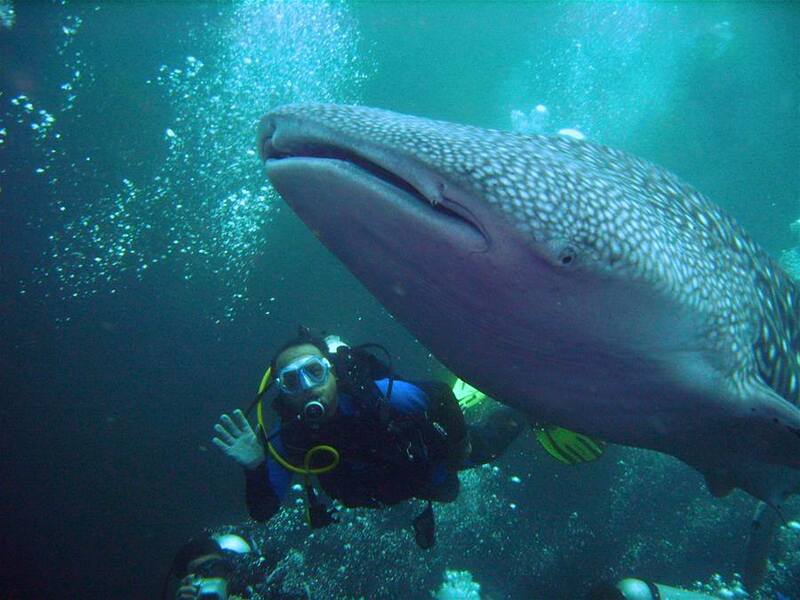 Your best chance to dive with Whale Sharks in Thailand is at Richelieu Rock. Richelieu Rock is dived from mid October to early May but the best time is February to April. It’s an awesome divesite with or without whale sharks. 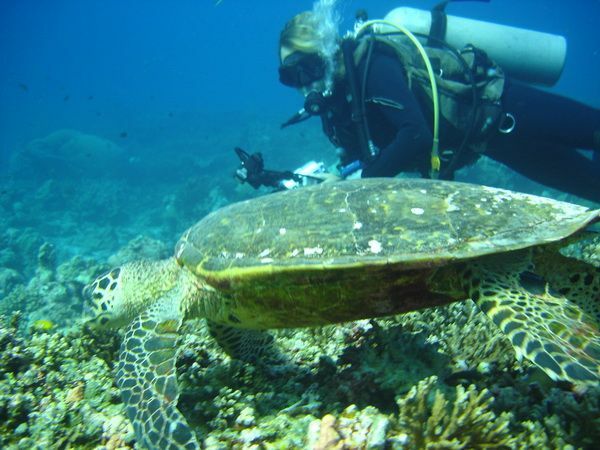 Richelieu is dived from liveaboard dive boats, most of which also visit the Similan Islands. Occasional whale shark sightings can happen any where but are not as common as at Richelieu. Phi Phi Islands (Bida Nok and Bida Nai) get the occasional whaleshark passing by and hanging out for a few days. 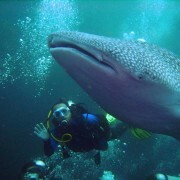 Some lucky divers see whale sharks at Phuket Shark Point, Koh Doc Mai and the King Cruiser Wreck. 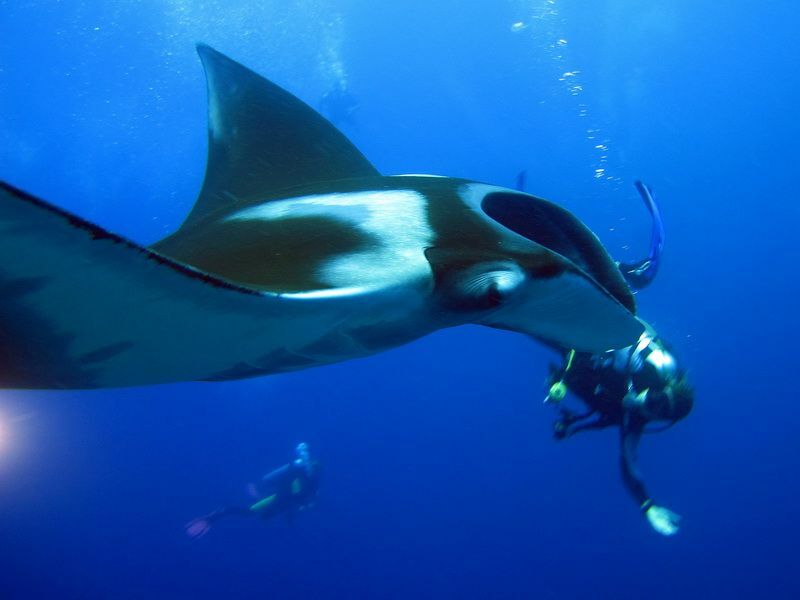 Koh Bon is the best dive site in Thailand to see Manta Rays. They are pretty regular visitors between November and April. The best way to dive Koh Bon is by liveaboard although speedboat diving day trips are available from Phuket and Khao Lak. 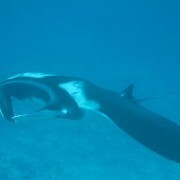 Nearby Koh Tachai is a great strong current dive site with cleaning stations that the Manta Rays love. When the mantas are there they tend to hang around for your whole dive. 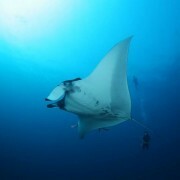 Mantas can also be seen at the northern Similan dive sites like north point and deep six. The visibility at these granite boulder dive sites is always superb so photo ops are excellent. 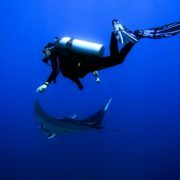 Hin Daeng and Hin Muang are also very good dive sites to see mantas from November to April. Short (2 or 3 night) liveaboards head to Hin Daeng from Phuket. Or you can take a day trip speedboat from Phi Phi or Koh Lanta. 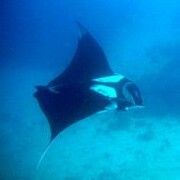 Racha Noi, south of Phuket gets Manta Rays at it’s south plateau. Eagle rays and schools of barracuda may also be seen. Leopard sharks can be seen all over Thailand. A Similan liveaboard trip should give a few sightings. Shark Point near Phuket can be a great spot for seeing them. Actually more are seen in the low season than the high season because fewer boats are around to scare them off. Phi Phi Island dive sites are also a great place to look for Leopard sharks. Black tip reef sharks are common at Phi Phi dive sites. Large examples are seen early morning at Bida Nok and Bida Nai but tend to be quite skittish so sharp eyes are required. Small schools of black tips can be seen along Maya Wall by divers and snorkellers. They often hang around the mooring buoys where the boats stop for lunch. While diving Phi Phi look out for small bamboo sharks. Black tips can be seen on the edges of the reefs at the Similan Islands. White tips and grey reefs are seen less frequently. Guitar sharks are a rare treat when they are spotted. The occasional grey reef shark is seen at Koh Doc Mai, a dive site more typically associated with small stuff. Turtles can be seen on many Phuket dive sites, especially since the Phuket Marine biological department started a breed and release program. The Similans has quite a few that snorkelers as well as divers can enjoy. Liveaboard divers moored up near Mooring Rocks or in Donald Duck Bay with often see Hawksbill turtles swimming on the surface near the boat. Turtles are also common at Phi Phi Islands and there is a huge Hawksbill turtle living on the King Cruiser Wreck that says hello to divers on safety stops. Watch out for your hoses as he (or she?) likes to bite. 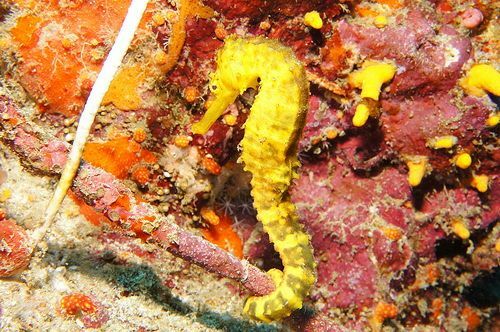 Eagle eyed divers will find interesting critters on every dive site but here are just a few regulars to look for. Pattaya has several old wrecks. Phuket has the King Cruiser Wreck which is a popular day trip. It’s full of marine life but pretty collapsed now and penetration is not possible. Technical diving is slowly growing in Thailand and some deep (50+ metres) World War II wrecks are just being discovered off Phuket. Let’s face it, diving is not a cheap sport. The cheapest place in Thailand to dive is Koh Tao. The more dives you do the cheaper it gets. The diving ain’t great (apart from Chumphon Pinnacle). You’ll be in the water with lots of other bubble blowers and visibility is often low but if you just want to build up time underwater it may serve a purpose. Koh Tao is popular for learning to dive. In Phuket you can arrange beach dives or long tail dives but they are not really that much cheaper than diving on the day trip dive boats. The liveaboards with 4 dives per day at the best dive sites, accommodation and meals, tend to offer the best value, if not the cheapest diving, when everything is considered. The granite islands always have the best visibility with much less suspended matter in the water. The Similan Islands are pretty much always gin clear. Racha Noi to the south of Phuket, also has excellent visibility. The best diving in Thailand is in the Andaman Sea from November to April. But if your holiday falls between May and October where should you dive? The Similan Islands, Koh Bon, Richelieu Rock are all off limits. So are Hin Daeng and Hin Muang. The best place to be is Phuket. Day trip dives run all year round from Phuket to local dive sites like Racha Yai, Racha Noi, Shark Point, King Cruiser Wreck and Koh Doc Mai. There are also day trips and overnight trips to Phi Phi Islands. 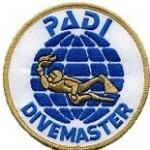 Some divers prefer the low season diving because there are fewer boats running and fewer divers in the water. Often the diving is just as good in the low season as it is in the high season but it is possible to have days when swell or waves make the boat ride uncomfortable. Phuket is now a year round destination whereas other Thailand resort areas effectively shut down for low season months.